After that thunderstorm and high winds on Bay du Vin, near Miramichi, we had a bad night of wave slapping on the hull and were up at 0530 feeling rather worn out, but eager to get underway to our next destination, Bouctouche (pronounced - Buck-too-shhh), New Brunswick. 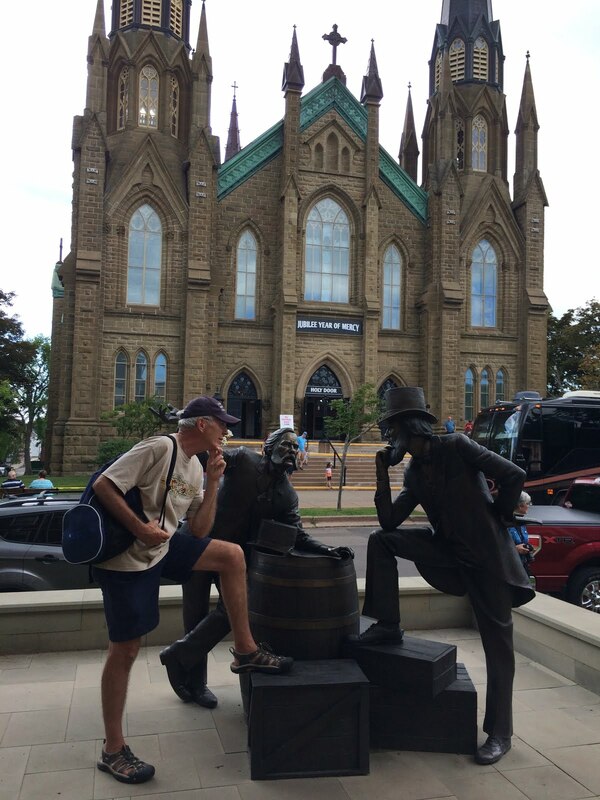 It was a long, 67 mile run, but we were looking forward to meeting up with Dave and Judy from Sir Tugley Blue, whom we’d been separated from since June 21st. 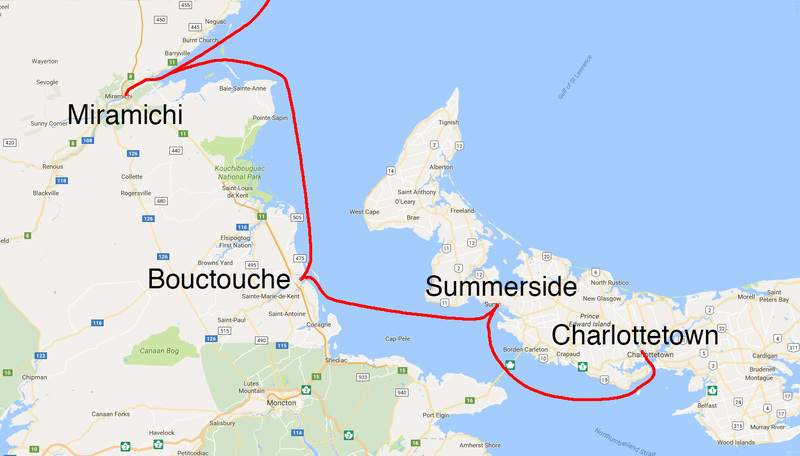 For us, the run out to Point Escuminac and south to Bouctouche was a very smooth one, but for Sir Tugley Blue, the first half of their run from Shippigan to Bouctouche was much rougher and uncomfortable. 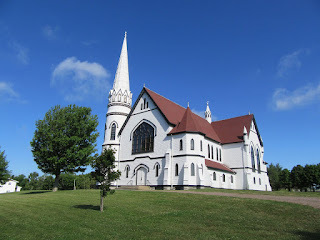 Bouctouche is a small village of 2,400 on the Bouctouche River. 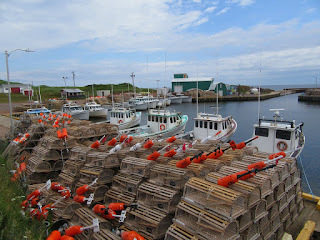 The name comes from the Mi’Kmaq word meaning “Great Little Harbour”. 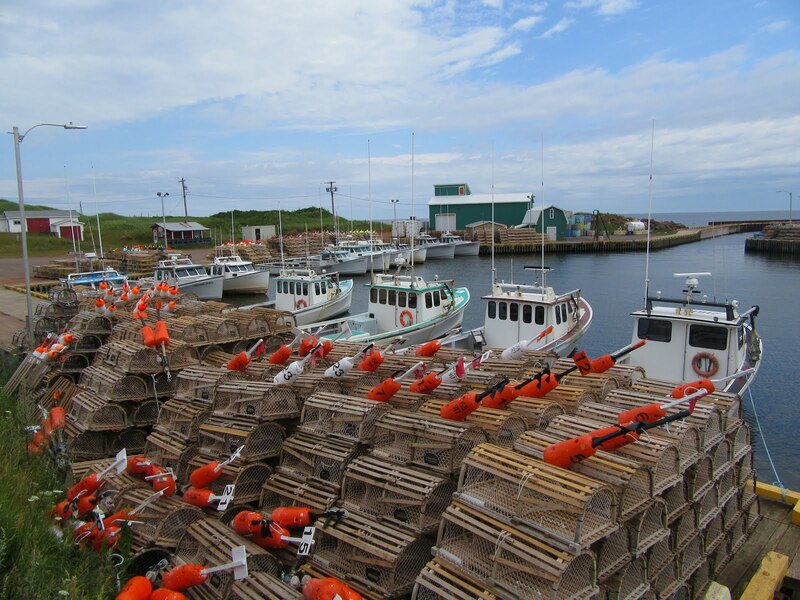 It was first settled by Acadians in 1785 and in the 19th century by Irish and Scottish immigrants. Today, 89% of the population are French speaking. 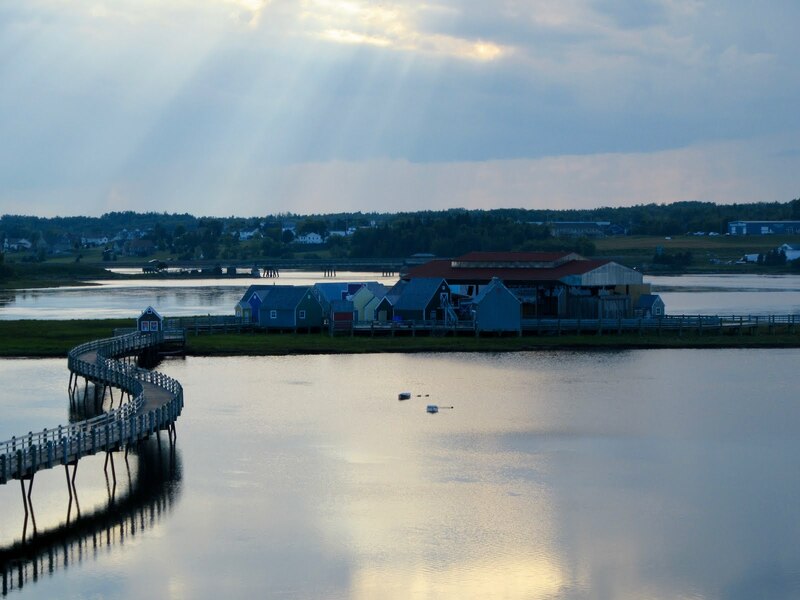 Bouctouche is best known for its shoreline sand dunes formed by centuries of wind and stormy seas. 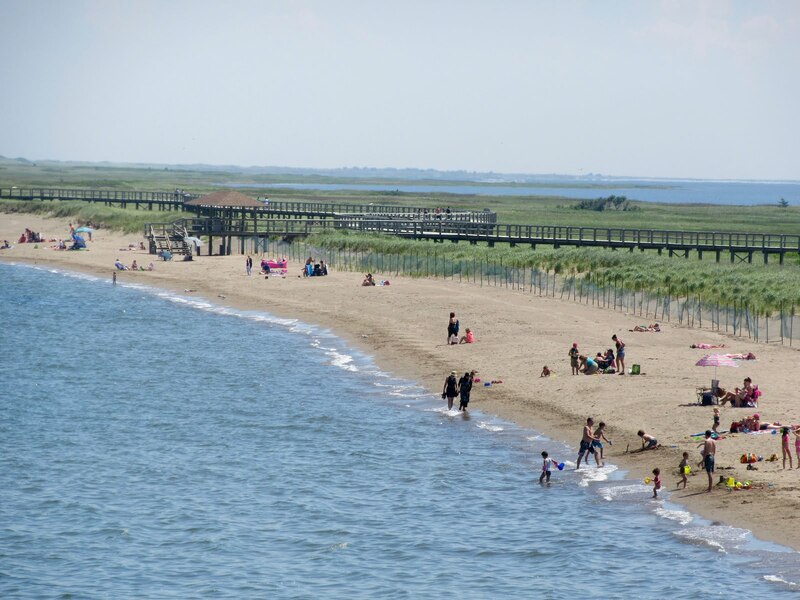 The sand dunes have almost closed off the entrance to the bay, which is now 1.8 kilometres wide and still shrinking. 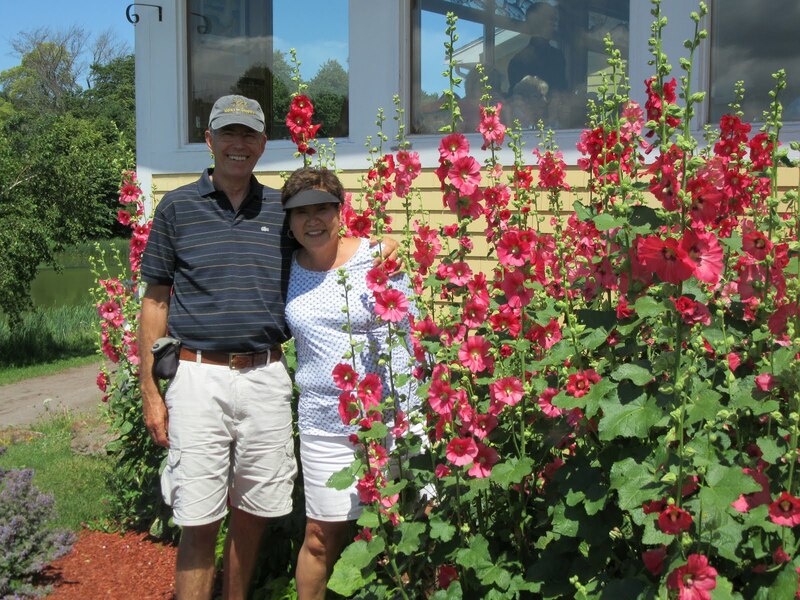 Today, New Brunswick and the Irving family go hand in glove. Kenneth Colin Irving (Mar 14, 1899 - Dec 13, 1992) was one of Canada’s foremost entrepreneurs of the 20th century and was ranked as one of the world’s leading industrialists. K. C. Irving’s businesses began with a family sawmill in Bouctouche, NB.The Irving conglomerate of private companies now includes shipyards, oil exploration, refining and retailing, various food processing operations, media, hardware, building supplies, transportation, engineering and construction companies and more. All these companies are vertically integrated with each Irving company purchasing the services of other Irving companies keeping the profits wholly within the conglomerate. Reportedly, a majority of New Brunswicker’s work either directly or indirectly for the Irving family. The Irving family have almost a complete monopoly in print media in New Brunswick. Their level of influence is of potential concern, but on the plus side, they have invested considerable funds into environmental controls and alternative energy for its operations. The Irving family and all their companies are actively supporting Canada’s ratification of goals to reduce the country’s carbon footprint. In the 2011 list of Canadians by net worth, the combined Irving family ranked third in Canada at $8.07 billion. K. C. Irving and his wife were first buried in Bermuda. 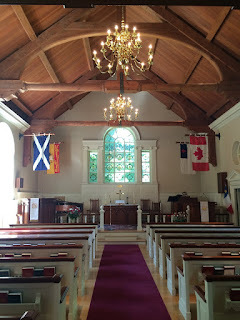 Later, in 2004, their bodies were exhumed and moved to the Scottish-style chapel built on the Jean Irving Plantation in Bouctouche, NB. 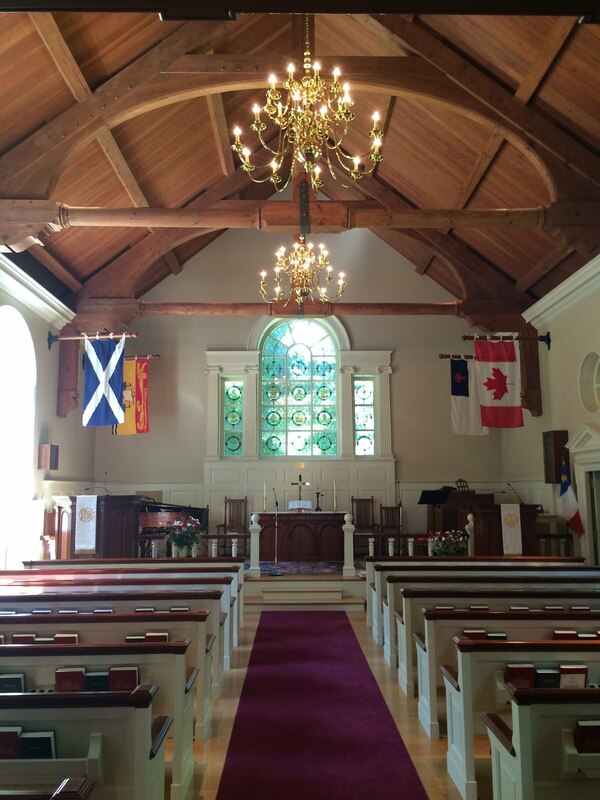 This chapel is modelled after one in Scotland and master craftsmen were brought in to construct it. As the photos below show, it is a stunningly beautiful structure completed with great care and skill. The Jean Irving Plantation was created under the direction of Jean Irving over a 35 year period. 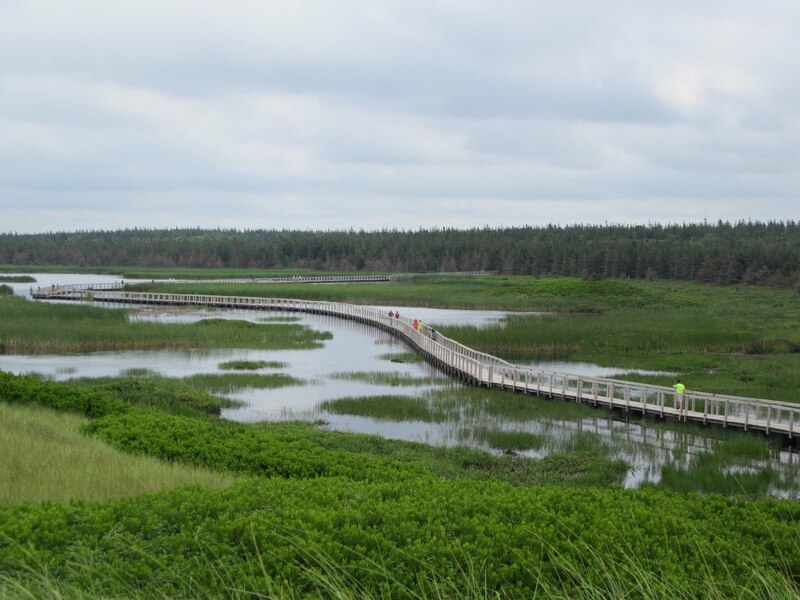 It has over 5,000 trees, all indigenous to New Brunswick. The plantation also includes an Elizabethan garden, ponds, picnic tables, benches and walking paths for visitors to wander and enjoy the setting. 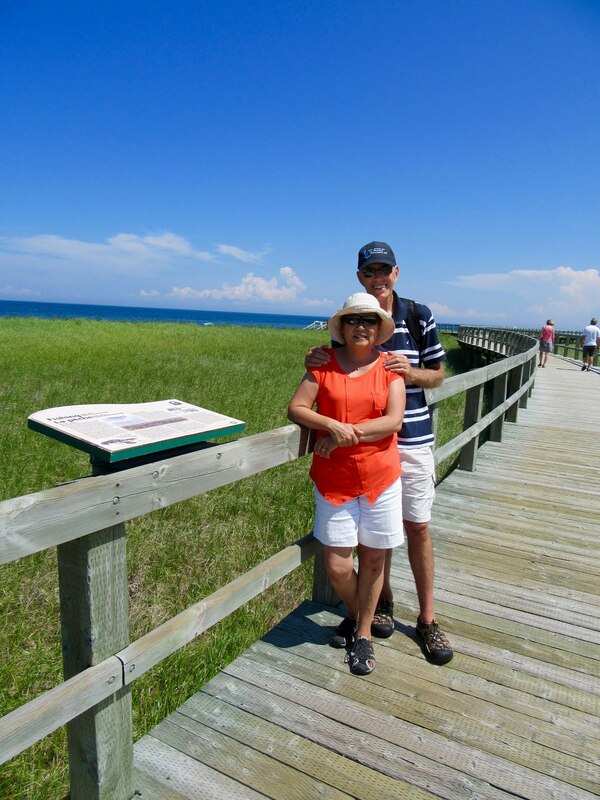 The Irving family have also taken a special interest in preserving the Bouctouche sand dunes so future generations may enjoy this special area. 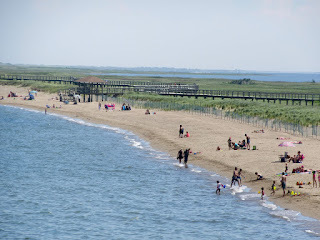 They installed boardwalks through the dunes so visitors can enjoy them without damaging the delicate marram grass that protects the dunes from erosion. 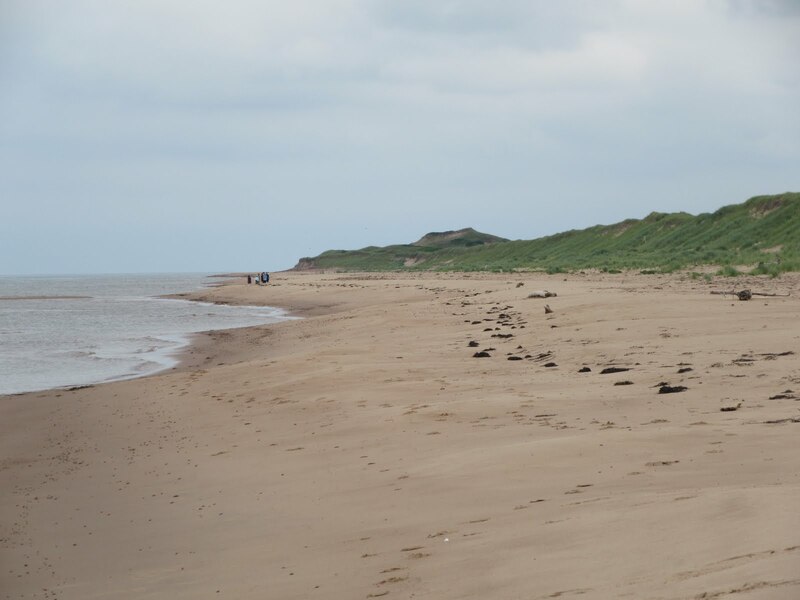 They also installed an interpretation centre (Irving Eco Centre) for visitors to learn about the dunes history and the over 2,000 year time frame it took for their evolution into the present state. We took a walk along the lovely board walk and also walked the beach barefoot, enjoying wading in the fairly warm waters of Northumberland Straight. Later, we visited Le Pays De La Sagouine, a reproduction of a prohibition-era fishing village where you can discover Acadian culture through a group of unique characters, theatre, music, comedy, dance and cuisine on a small island in the town of Bouctouche. We enjoyed some lively music and dinner there, as the sun set. A perfect end to a great day. Monday, July 25, 2016. Another week, another province. 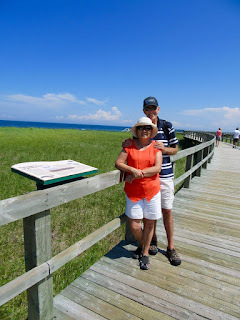 Today, we headed off to Prince Edward Island, crossing the famous Northumberland Straight. 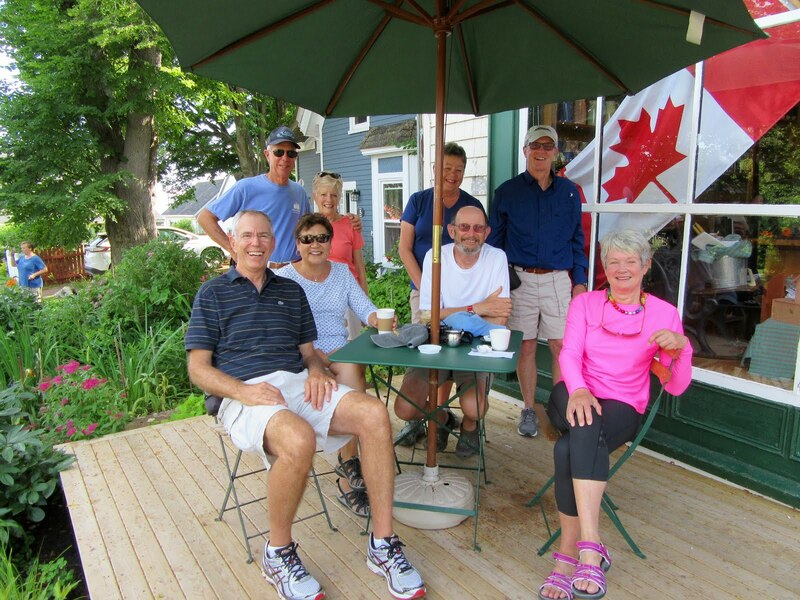 Again, we were blessed with good weather and had a smooth ~ 42 mile crossing, tying up at Silver Fox Yacht Club in Summerside, PEI. 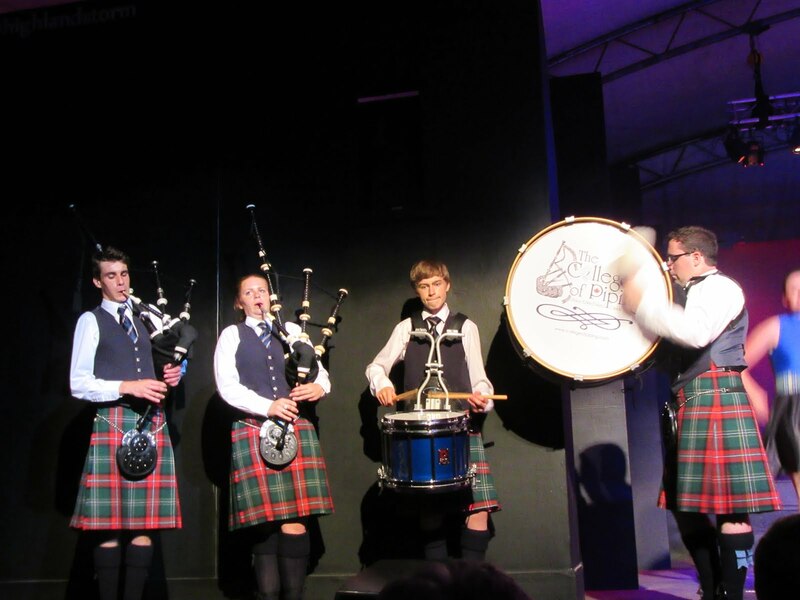 After getting settled, we headed off for an evening performance at the College of Piping & Celtic Performing Arts of Canada. The show was called “Highland Storm” where we were entertained by a wide range of Celtic music (bagpipes, guitar, drums, harp and more) and dance (both traditional and more modern highland dancing), performed by faculty, students and alumni. During intermission, we dined on strawberry shortcake with whipped cream, a favourite of mine - mmmmmmm!!!! 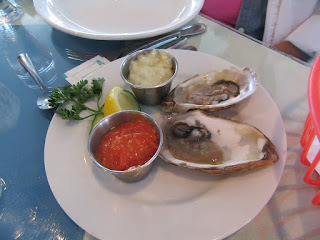 All in all, it was a real treat and a great introduction to PEI. 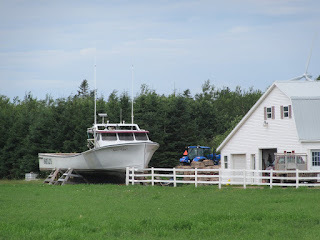 Over the next two days, our crews of four boats rented two vehicles and we toured as much of the PEI countryside as we could. On Tuesday July 26th, we toured much of the North Coastal Route all the way out to North Cape and back, in a large circle. 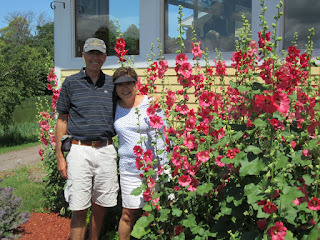 Everywhere we went, the homes, properties and farms were all impressively well maintained, neat and tidy. Every second farm seemed to have a lobster boat up on blocks after the conclusion of the recent fishing season, cleaned up and ready for 2017. We toured Mount Carmel Catholic Church, bought fresh cod from a fishery on the north west coast, saw the wind farm on the North Cape, had a seafood lunch (Lightkeeper’s Platter) at the Wind & Reef Seafood Restaurant, had beers at the West Point Harbour “The Catch Kitchen & Bar” and more… The photo of our Lightkeeper’s platter includes: two bowls of chowder, one lobster, raw oysters, scallops, shrimp, haddock, 2 pounds of mussels, Caesar salad, green & yellow beans & carrots and rice. It was awesome! On Thursday, July 28th, we departed Summerland for Charlottetown, the Capital of PEI. 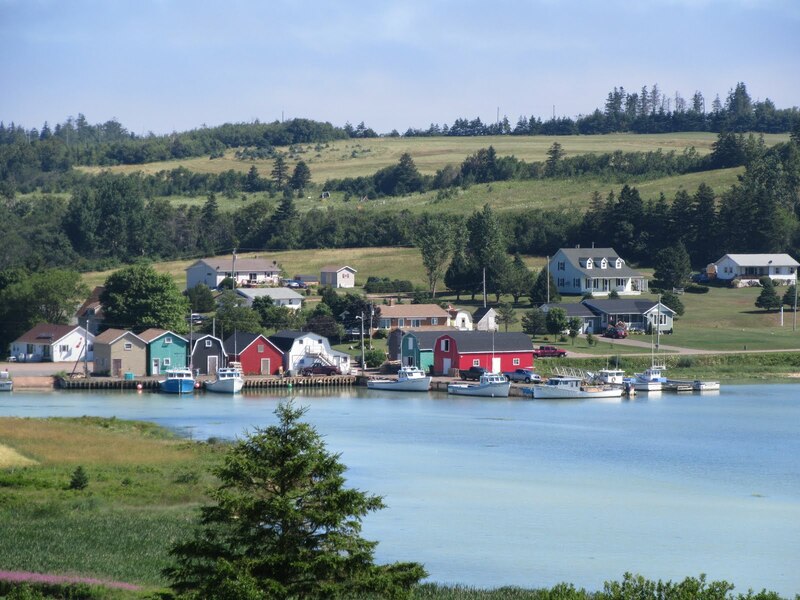 Prince Edward Island is Canada’s smallest province of only 5,660 square kilometres and a population of approximately 147,000. 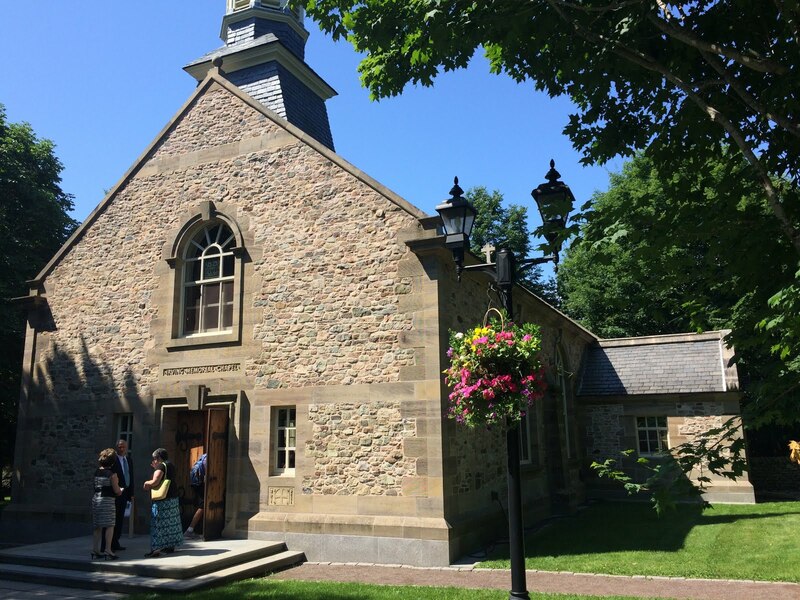 It has a special place in Canada’s history as it is called “the Birthplace of Confederation”. 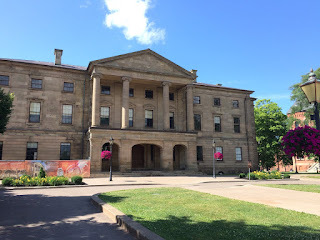 Back in 1864, Charlottetown hosted the “Charlottetown Conference” where the maritime colonies of Nova Scotia, New Brunswick, Newfoundland and PEI were to discuss a maritime union at the urging of Britain, so they could become more economically independent from Britain (cost Britain less) and have greater military power for the region in the hopes of preventing any military intervention from America. The Province of Canada (comprising today’s Ontario & Quebec) heard about the planned conference and asked to join in and expand the agenda to discuss a union that would also include them. In September 1864 the conference was held and the delegates from all these regions (both government & opposition representatives) had lengthy meetings and social gatherings and in the end, they reached a level of understanding that created sufficient momentum that by July 1, 1867 the Dominion of Canada was formed. Initially, it included only four provinces (Ontario, Quebec, Nova Scotia and New Brunswick) with the remaining six provinces and three territories joining at later dates. 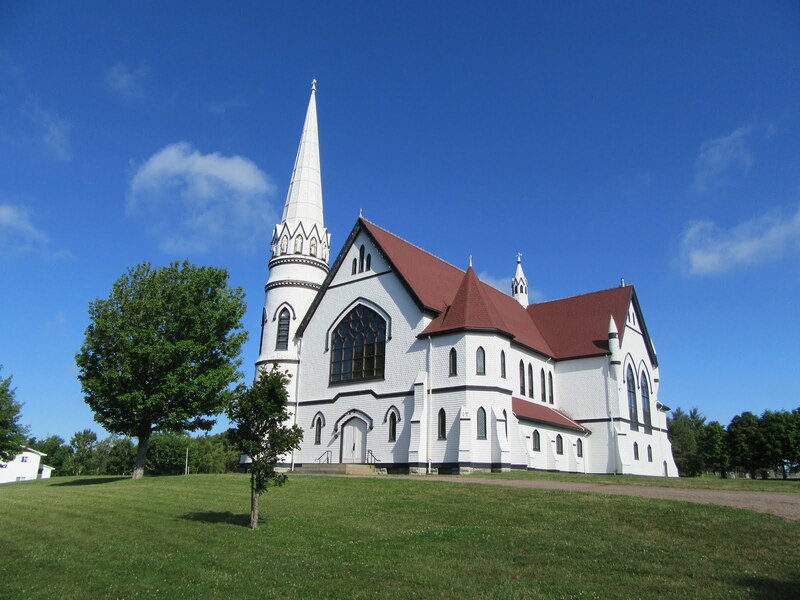 Prince Edward Island joined Canada as a province in 1873 after negotiating a Federal Government commitment to provide “…efficient steam service for conveyance of mail and passengers between the island and mainland, winter and summer…”. 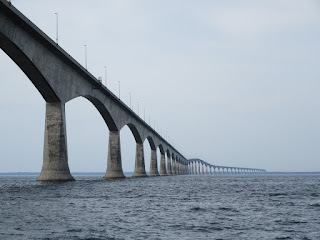 Today, we were very excited to travel by boat from Summerside to Charlottetown as we’d have the opportunity to pass underneath the Confederation Bridge. 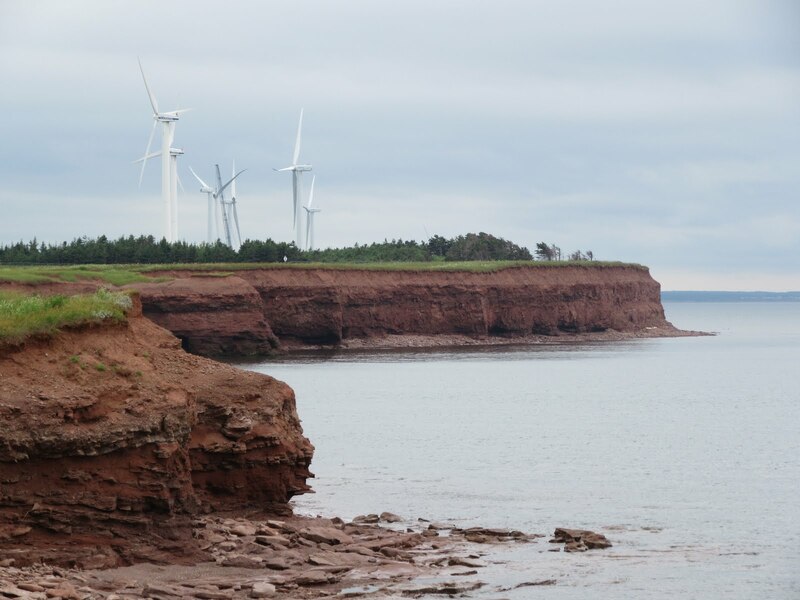 While PEI enjoyed various forms of ferry service to and from the mainland with growing federal subsidies over the decades, the cost kept growing, prompting regular discussions about building a fixed link to the island. Finally, a proposal in the mid 1980’s resulted in the current bridge being built. However, there were conflicting views in PEI about the project resulting in court challenges, lengthy environmental impact studies and concerns from “Friends of the Island” who felt the fixed link would forever change the unique character of the island for the worse. A constitutional amendment was also required to deal with the change in service from ferry to bridge and the charging of tolls. Construction of the bridge took place from 1993 to 1997. All components of the bridge were built in purpose built staging yards at Amherst Head, New Brunswick including pier bases, ice shields, main spans and drop-in spans. Extra durable concrete and rebar was used in all the pre-cast components and the bridge was designed to last over 100 years. A Dutch built, heavy lift catamaran was rented to move the bridge components out into Northumberland Straight and put each one in place. The project required over 5,000 workers including engineers, surveyors and managers. The two lane toll bridge is 12.9 kilometres long and cost $1.3 billion. The multi-span beam bridge with post-tensioned concrete box girders has 44 main piers, each 250 meters apart and 18 smaller piers. It has a speed limit of 80 kilometres per hour. A car toll is $46 in 2016 for the round trip. Pre opening of the bridge, there were about 740,000 visitors to the island per year. In 1997, the year it opened, there were 1,200,000 visitors, but this has dropped back to 900,000 visitors per year. The number of overnight guests visiting the island has dropped as more people can now make day trips to PEI. 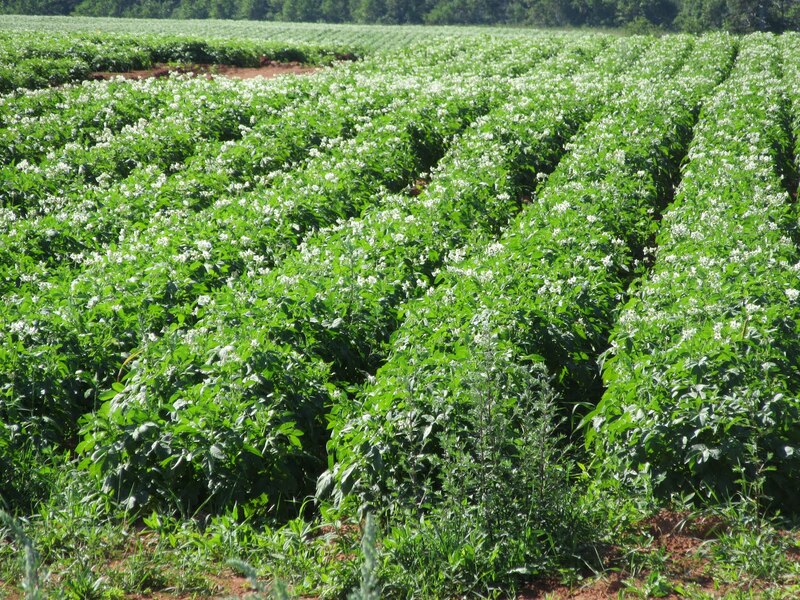 Agricultural exports from the island increased significantly after the bridge opened. 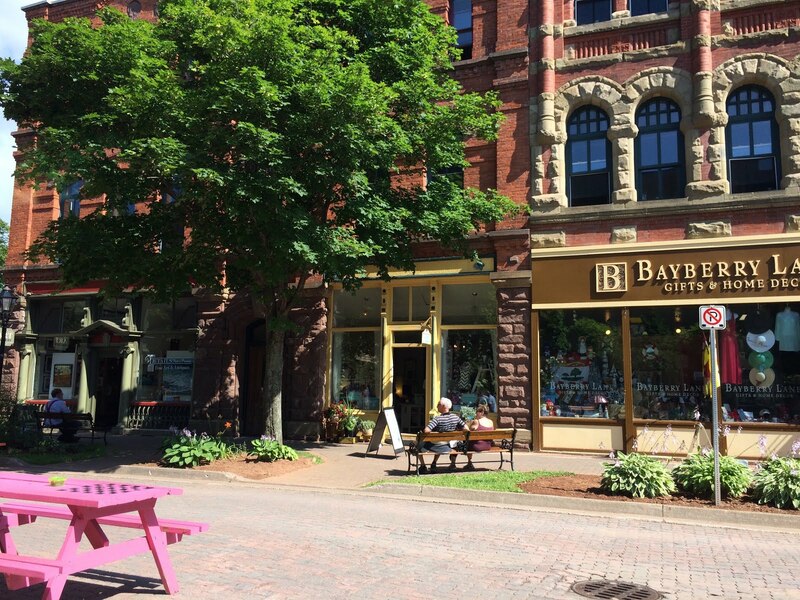 Big box stores have opened on the island providing more retail products to residents than ever before, but inevitably, it resulted in closing of many family owned retail outlets. Passing under the bridge was a huge thrill. It is a massive and beautiful structure and our pictures do not do justice to the marvel of the engineering of this bridge. After arriving in Charlottetown, we were picked up by a university friend of Stephen and had a wonderful reunion at the home of Ron, Hillis and their daughter Heather. Stephen had last seen them in about 1986 and Fran had never met them. 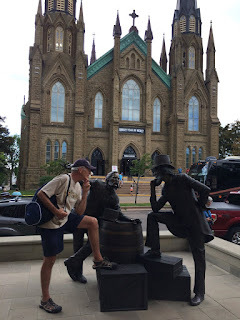 We had the most wonderful time together reminiscing about previous adventures including a 4 month backpacking trip Ron & Stephen did around Europe in 1973. 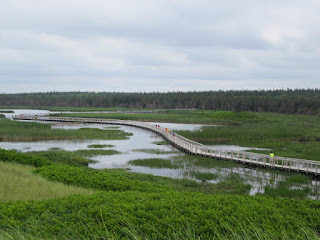 The next day, Stephen and Ron spent the day together hiking through the Prince Edward Island National Park of Greenwich, PEI including visiting the interpretation centre covering the eco sensitive dunes on PEI’s north shore, followed by a fish lunch in Greenwich. 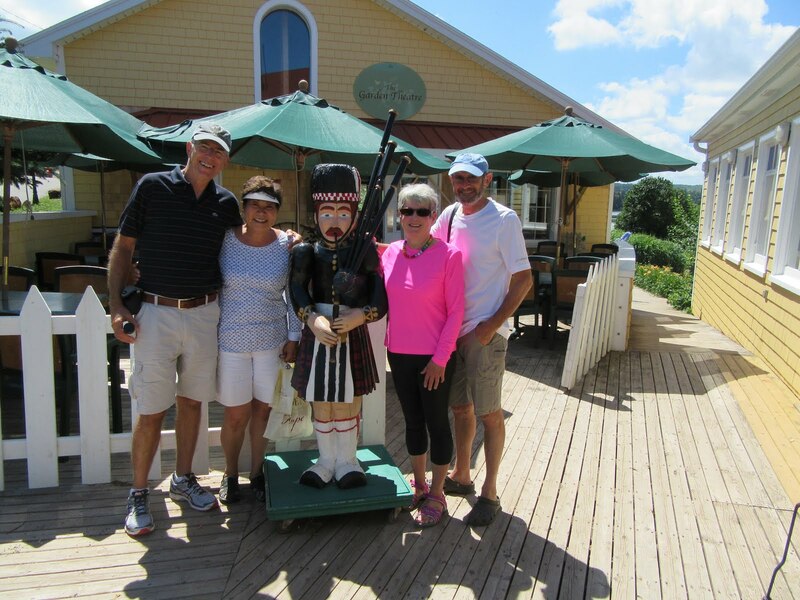 Later that evening, Ron and Hillis joined us for a tour of Tug’n in the Charlottetown Marina and dessert on board. 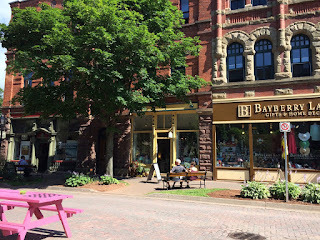 On our third day in Charlottetown, Fran and I spend the day exploring the downtown including a visit to the Saturday Farmer’s Market, St. Dustan’s Basilica, Victoria Row (a pedestrian street), Province House (where the Fathers of Confederation met for the Charlottetown Conference of 1864), Cow’s Dairy (reputedly the best premium ice cream in the world) and more. 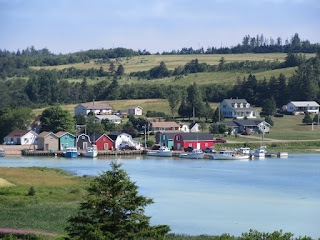 PEI, its cities, its countryside, its sandy dunes and beaches on its north shore, its red cliffs on its west and south shores, its neat and tidy farms and its many commercial harbours is exceptionally beautiful to see, taste and experience. The people are so very friendly. There were tourists from all around the world enjoying it with us. Licence plates on the cars were from all over Canada and the US. 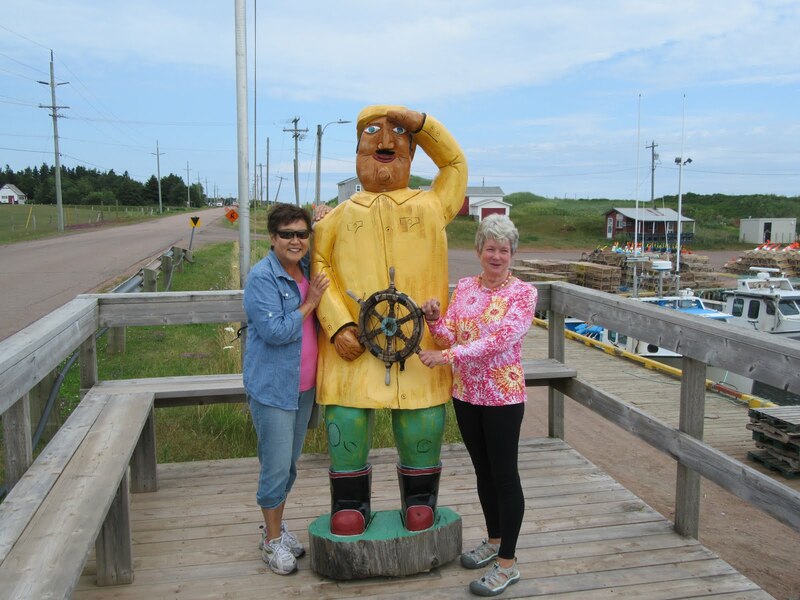 PEI really is a special part of Canada and it too should be on everyone’s bucket list. PEI has enormous charm and beauty and we loved every moment of our six day visit. However, PEI would not be our first choice for a winter residence. You’d have to have a special love of winter, snow and wind for that. 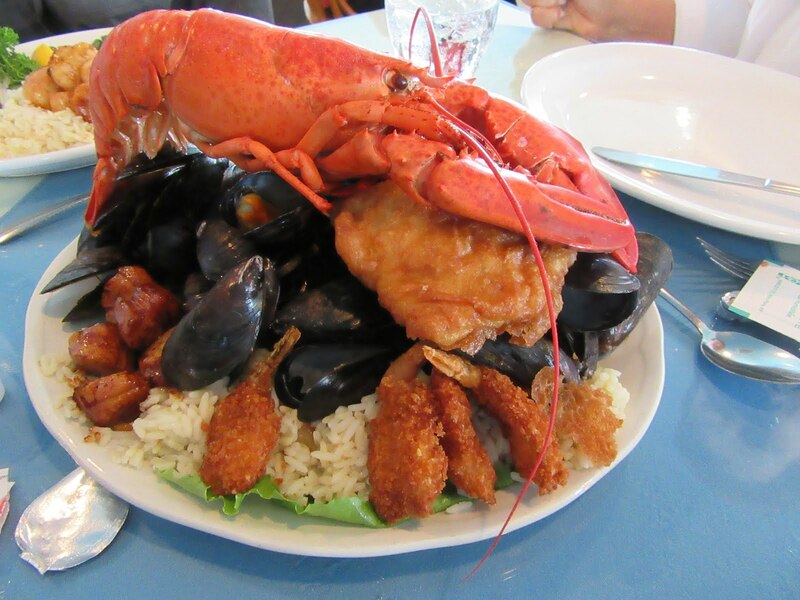 Thank you - Prince Edward Island!